Hi Everyone!! It’s me, Fuji!!!!! I am having so much fun with my new family. Last night when I got out of the car to my new home, I barked a lot because all these new people were staring at me and patting me. After a few minutes though, we all went inside and I showed them how I play with my teddy bear that my Foster Mommy packed for me. I got to see my new forever home and everybody laughed when I ran around the living room like a puppy, I liked it when they laughed so I ran faster and faster!! I got to sleep with my new Mommy and Daddy in their bed, and I liked sleeping really close and under the blankets! It’s nice and warm under the blankets! Today I got to meet the other doggies and kitties that live here because my Mommy wanted to give me time to adjust first. The doggies are very big so I growled at them when they came near, but we all went on a nice walk together and now I don’t mind them so much. I heard they are my sisters but I don’t think we look alike!!!!!! There is a big cat here that I like because he leaves me alone, but I am still trying to figure out the baby cat. My family says we will all be great friends very soon. I also had a bath tonight because I got all mucky from the walk earlier when it started to rain. 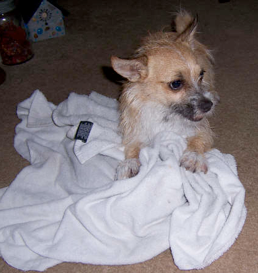 My Mommy says that I am very small so I got to have a bath in the kitchen sink! Everyone was staring and taking pictures, I didn’t think it was as fun as they did! After my bath I showed them how I dry off on a towel, they laughed so much, so then I ran around the living room again to make them laugh harder. It was just so much fun! Well, I am very sleepy now because it has been a very interesting day for me. So I am going to go to bed with my Mommy and Daddy. Thank you for saving me and finding me a nice family to spend my life with. I miss you all and love you very much!